by Jerry Bridges et. al. Want to know God deeper? This beautiful collection of 312 readings with devotions explores the nature of our loving God. 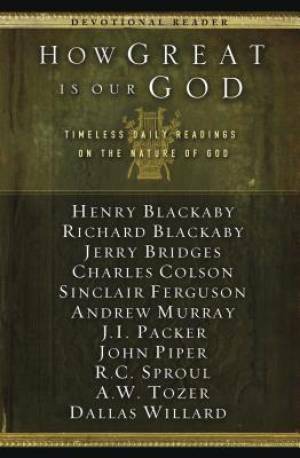 Readers who want to know and experience Him on a deeper level will enjoy having excerpts from these masterworks at their fingertips in this convenient collection. How Great Is Our God by Jerry Bridges et. al. was published by Navpress in September 2011 and is our 193rd best seller. The ISBN for How Great Is Our God is 9781612910789. Be the first to review How Great Is Our God! Got a question? No problem! Just click here to ask us about How Great Is Our God. Author / Artist Jerry Bridges et. al.